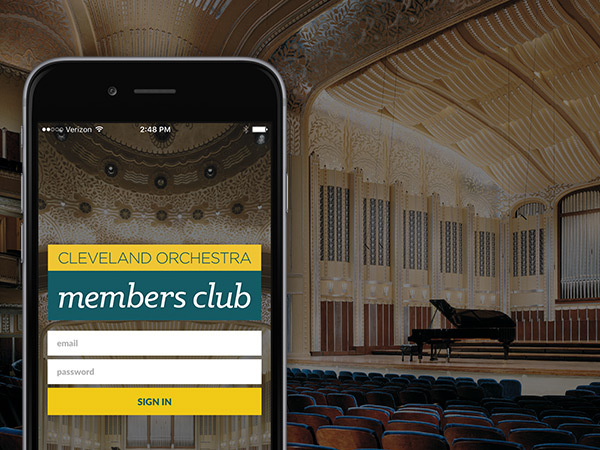 L2 Interactive is pleased to announce the launch of The Cleveland Orchestra’s fully custom, Tessitura integrated mobile “Member’s Club” App. This $35 per month membership program is designed to offer convenient, flexible, and affordable tickets to Cleveland Orchestra’s vast concert offerings. Available for iOS and Android, members can reserve a single ticket for $10 to any concert, at any time, through the App. L2 began work on the App in Summer of 2015, releasing it as an invitation-only pilot program in Fall of 2015. Now, Cleveland Orchestra has rolled it out to the general public. Click here for more information on Cleveland Orchestra’s “Members Club” program. 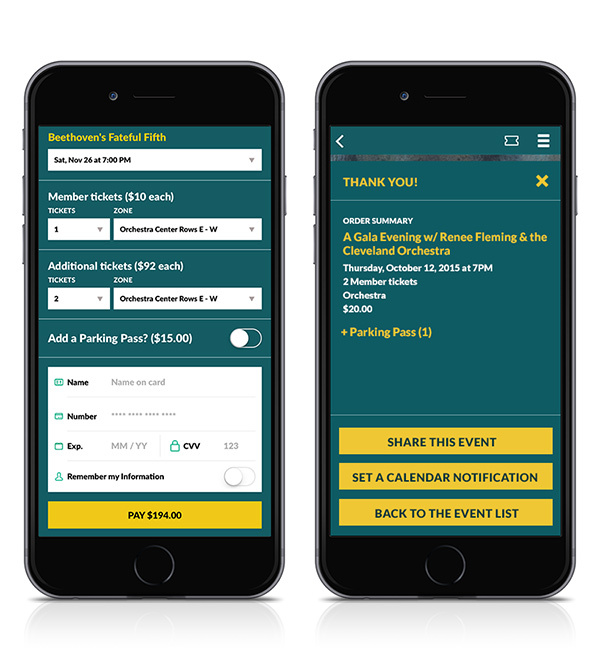 When Cleveland Orchestra approached L2 to discuss the “Member’s Club” App, they had identified that by offering patrons of the Members Club a well thought out, intuitive App, they could provide a more flexible way for them to participate with the Orchestra. 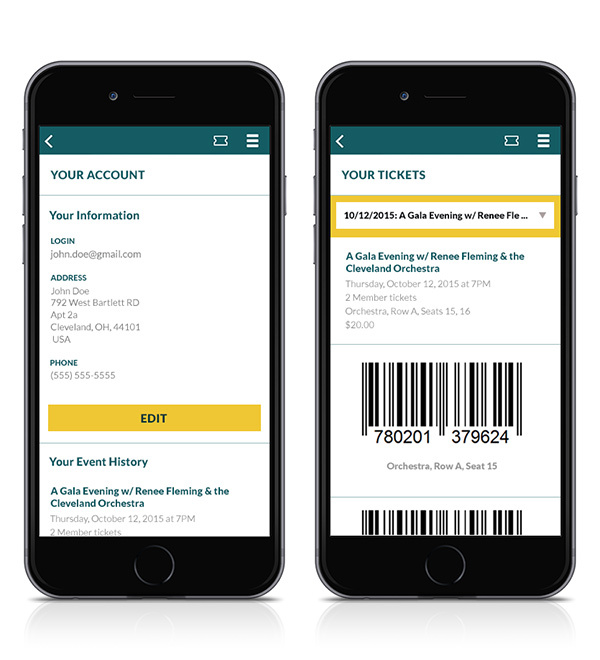 Recognizing that Apps are now important tools to engage with their customers, Cleveland Orchestra looked to this technology to create a new, faster path for these patrons to purchase and use tickets. The app now forms a critical piece of this new, cutting edge loyalty program for encouraging repeat attendance through simplifying and improving the ticket purchase experience. L2 jumped at the chance to work with the team at Cleveland Orchestra to brainstorm the App’s design, functionality, and Tessitura integration. With Cleveland Orchestra, L2 built the App from the ground-up and we’re extremely proud of the finished product. Upon logging in, members can browse all of the concerts on the event listing page, and even apply a filter to further narrow down results by Classical, Pops, Holiday, and Family/Education genres. If members have specific performances in mind, they can utilize the search feature to find composers, concert titles, composers, and much more. Tapping on an individual concert pulls up that concert’s detail page and gives additional information and any supplemental material on the performance. From the concert listing page, members can also share upcoming concert plans with friends via social media such as Facebook. 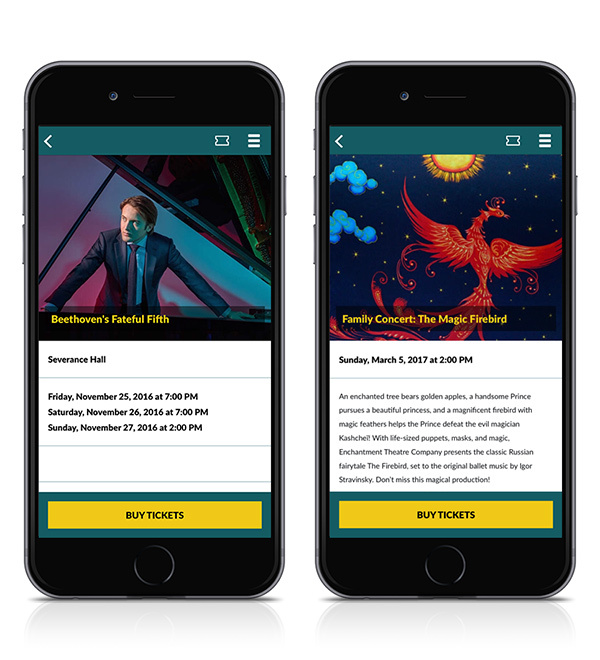 The App includes Admin tools for Cleveland Orchestra so that they can set concerts as low availability or sold out, as well as set a featured concert to appear above all the other concerts in the listing. After a member selects the “buy now” button from a concert detail page, they enter the purchase path. Once a date is selected, the number of eligible tickets the user has at the membership price is displayed along with the cost per ticket. Members can add tickets to their order at standard ticket prices. The confirmation screen allows members to set a calendar reminder and to once again share on social media. For easy management, payments are processed through Stripe, and L2 passes an authorization code into the checkout method that feeds into Tessi for easy integration into the constituent record. 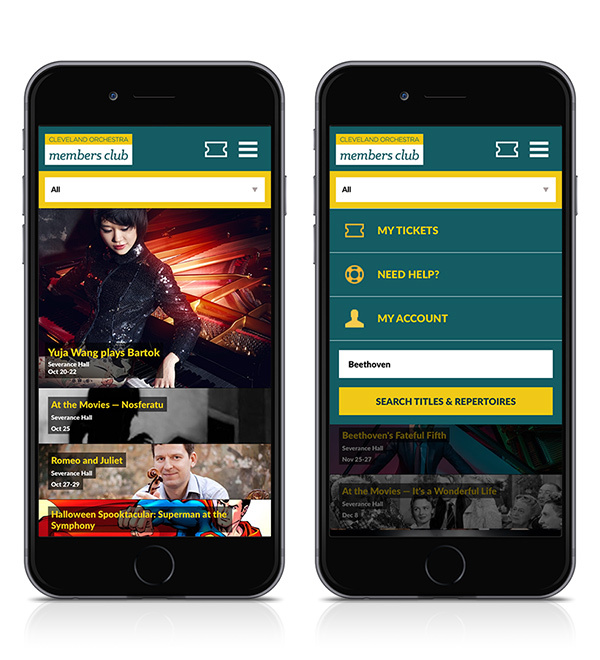 Once a patron joins the “Member’s Club” they can log into the App via the Tessitura login. Within the App, these new members can manage their contact details, and see their purchase history. If a member has upcoming tickets they can access them here, and use them for entry into concerts, directly from their phone.